In the modern era, there’s nothing to see in Santa Fe, Kansas. The tiny town is now abandoned, with only a large feed lot marking what is otherwise considered a “ghost town” in the 21st Century. There wouldn’t have been much more to notice in January of 1918, as Santa Fe was already crumbling, only two years away from disappearing completely. But something within the town had caught the eye of Dr. Loring Milner – a flu-like virus unlike anything he had ever seen or read about. In 1918, like today, influenza threatened the very young and the very old. Those with compromised immune systems would typically be at risk for fighting off the worst strains of the flu. What Milner was witnessing was the reversal of that script – a flu that attacked the healthiest adults and killed within days. Those who were ill would develop a fever and become short of breath, with their faces turning blue from a lack of proper oxygen. Lungs would fill with blood and caused catastrophic vomiting and nosebleeds, with victims literally drowning in their own fluids. Milner and others suspected the virus might have come from the region’s livestock, but couldn’t be sure. What Milner did know is that the virus was a killer and needed to be contained quickly, writing to and being published in Public Health Reports, the predominate medical journal of the day. Few sources – in medicine or the media – paid attention. The influenza Dr. Loring Milner discovered would soon blanket the globe with a death rate comparable to “The Black Death” of the bubonic plague. What would become known as the “Spanish Flu” would spread over every continent, from major cities to tiny Pacific Islands and even the Arctic. Amid a global war that would kill 20 million, an estimated additional 100 million people – 5% of the world’s population – would fall victim to the deadliest outbreak in human history. 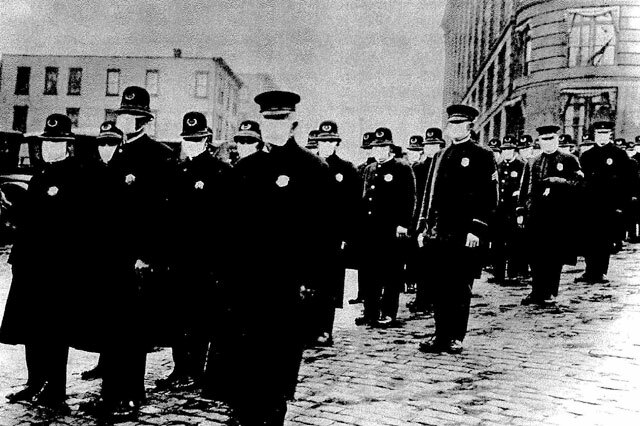 At every step, the narrative of the “Spanish Flu” meets misconception – from the origin, to the name, to even precisely what made this form of influenza so historically fatal. While modern records suggest Haskell County, Kansas as the home of the virus, there have been no shortage of locations earmarked as ground zero. Many originally pointed to outbreaks in China in late 1917 of similar-sounding virus, suggesting the flu was brought to Europe via the millions of Chinese laborers imported to aid the Allied cause. Others pointed to France given the high number of reported cases, but since the country was the point of disembarkation, it seems more likely that the source was elsewhere. A few researchers noted that Austria dealt with a similar outbreak in late 1917, dealing a blow to the theory that the virus came to Europe from abroad in the first place. The name itself – the “Spanish Flu” – represented a media creation as opposed to any actual point of origin. While most of Europe was under a media lockdown related to war reporting, Spain’s constitutional monarchy allowed for a free press that provided relatively objective reporting on the state of the Great War. As a result, most of the earliest reporting on the outbreak came from the country, leading to the impression that the virus started in Spain. Despite 100 years of various research, what precisely killed millions around the globe remains controversial. Studies have reached conclusions varying from bird or swine flu to bolder proclamations that the “Spanish Flu” was actually no different than the common variety influenza but was deadly due to lower mortality rates related to food deprivation especially in Europe. Most researchers agree that the virus originated in a non-human mammal around the early 1880s, mutating around 1912-13 into what eventually infected so many. With millions gathered together either as soldiers or as displaced civilians, the spread of the virus was made even easier. In less dispute was that the virus caused what is known as a “cytokine storm” – an overreaction of the immune system – supporting what Milner and others first noticed, that the healthier the infected person was, the deadly the outcome. A pandemic that threatened both the armies and civilian populations of the Allies and Central Powers was gaining momentum in early 1918 – and no one was doing anything about it. Private Albert Gitchell awoke on March 4, 1918 feeling horrible. He had a fever of over 103-degrees and aches and pains all over his body. Stationed at Camp Funston at Fort Riley in Kansas, Gitchell was assigned to semi-private tent for those with suspected contagions. The effort to contain whatever Gitchell had was likely already too late – Gitchell was the company’s cook and had prepared meals for the men. Before noon of that first day, 107 men at Camp Funston were reported sick. Within a week, over a thousand were ill, with 46 deaths (Gitchell was not among them; he survived the flu and the war and lived until 1968). 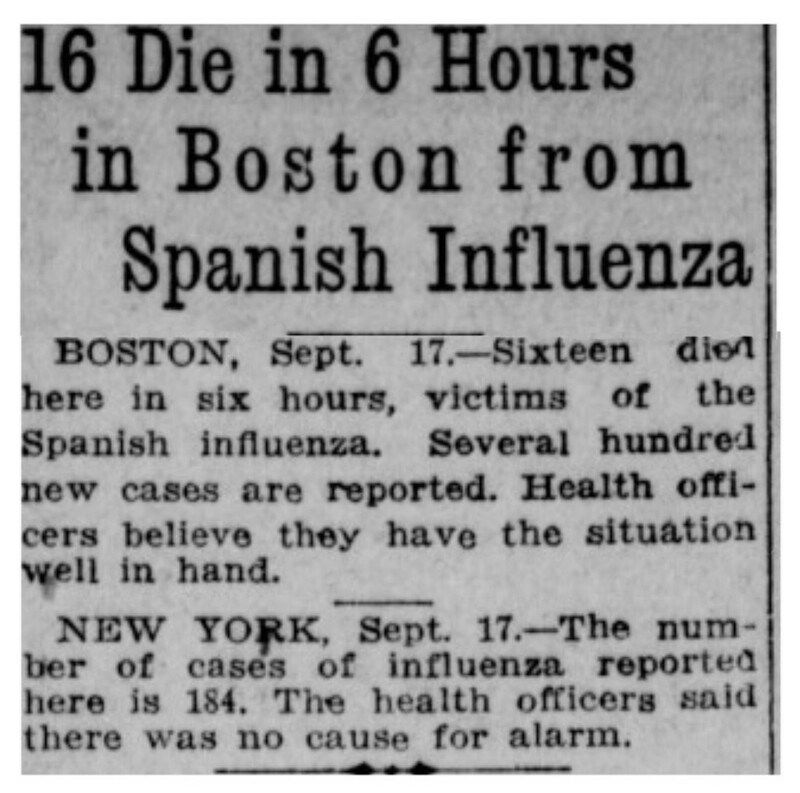 The “Spanish Flu” had it’s first “official” victims. By March 11th, the same strain of flu had arrived in New York City. Within days, similar reports were popping up in Brest, France, all likely carried by the American army. Uncle Sam’s “doughboys” were intended to save Europe; instead they looked to be bringing more death with them. The authorities did nothing in response. The scale of the infection was impossible to judge and with a variety of symptoms, many cases of the “Spanish Flu” were initially incorrectly diagnosed. Disease had historically always killed more men that combat. In the American Civil War, with 620,000 deaths, for every three soldiers killed in battle, five more had died due to disease. For the armies of the Great War’s combatants, illness-connected casualties were part and parcel of a standing army. Disease related deaths within the military could be whitewashed, especially amid a conflict killing millions, but civilian deaths were another matter. As the disease showed no signs of abating in the summer of 1918, despite the fact that influenza cases typically receded once the weather improved, authorities began to realize that silence was not an effective strategy. Part of the reason the virus didn’t abate was, as researchers would discover later, that the virus had mutated again into an even deadlier version. The natural life-cycle of a virus strain had been inverted – typically, a weaker strain is the one that spreads because those who are significantly effected by the illness don’t travel, minimizing their chances at spreading the disease. The reverse had been made true by the war – those who were deadly ill were transported behind the lines, often on rail-lines shared by civilians. Weaker strains had stayed in the trenches or military camps or were just strong enough in the civilian world to warrant staying at home. The “second wave” of the flu would cause most of the deaths associated with the outbreak, with some countries hit to a devastating effect. Persia would lose an estimated 22% of it’s population; Ireland would have 10% of all fatalities in 1918 related to the flu. Only those communities that limited travel and otherwise acted quickly were spared death rates that hovered around 5-10% for those stricken with the virus. Medical services were overwhelmed. Modern sanitation and public works departments were taken aback by the scale of the crisis. Despite a number of scientific innovations, medical practices relating to mass infections still took their cues from hundreds of years prior. It didn’t help that in some cities, like New York, the sanitation conditions were already horrendous, due to a combination of population size and government corruption. Most of these practices to combat the flu still weren’t in place by the time the “second wave” hit. This wave dwarfed the earlier strain in it’s deadliness. Whereas the first round of flu killed a relatively small percentage of those who contracted it, the “second wave” was not only frequently fatal but could literally kill within hours, not days or weeks. Worse, the war effort had dwindled the number of available experienced nurses and doctors in most nations. The dead stacked up like cordwood in major cities. Philadelphia, a city of less than 1.8 million in 1918, saw nearly 13,000 dead in just one month. Mass graves with up to 500 bodies were dug to prevent another health crisis from being unable to bury the dead quickly enough. Even the well-connected could not avoid the virus. Sir Mark Sykes, of the Sykes-Picot Agreement, died from the flu. The direct effect of the virus on the war effort would be minimal only due to timing, as the worst of the “second wave” wouldn’t really hit until the fall. Still, the potential to completely derail the war effort could be seen. In October of 1918, ship production in New York City had declined by 40% due to illness. 10% of the British Royal Navy would be out sick in the fall of 1918. By comparison, by the end of the war an estimated 40% of the United States Navy and 36% of the American army would contract the illness. Germany’s Erich von Ludendorff cited the sick rate of their armies on the Western Front as one of the major factors in the failure of the country’s last-ditch offensives. There’s a potential truth in Ludendorff’s analysis as the mortality rate in Germany and Austria-Hungary was much higher than among the Western Allies. As the flu progressed, nations began to even cancel draft boards, fearing that such meetings were contributing to the spread of the disease. Had the war lasted beyond November of 1918, the impact would have likely been even worse. After devastating the globe and killing untold millions, the “Spanish Flu” disappeared as quickly as it had apparently arrived. A “third wave” of the disease hit in the winter of 1919 (even President Woodrow Wilson came down with this strain) but it lacked the deadly impact of the prior wave. With fewer armies moving, and better prevention methods in place, the influenza dissipated into a common bug. Within a handful of years, despite the horrendous scale of death the disease had wrought, the memory of the “Spanish Flu” faded into the background of the end of World War I. In many respects, it became hard to differentiate between the horrors of the war and the horrors of the flu. Both killed young, healthy adults. Both killed because of deprivations in shelter and food in Europe. Separating out the flu from the carnage of the war was the equivalent of separating the individual horsemen of the Apocalypse – all brought misery nevertheless. While some have deemed the flu as the “forgotten pandemic”, medical researchers are not among them. Teams in the early 21st century hoped to recreate the virus from corpses buried in permafrost. What they found was even more terrifying – the “Spanish Flu” in those well preserved bodies was still active. This entry was posted in First Ringer, WW1 - Fact and Myth by First Ringer. Bookmark the permalink. My mother was born in 1917. The next year she lost two elder sisters to the Flu. Both Ruby and Marie were in their 20’s and the picture of health, yet died the ghastly deaths you described. 1918 was a tough year for my dad, too. Born in 1898, he saw two older brothers serve in the AEF. Both were gassed (mustard gas), made it home but died of the after effects the next year.